Alrighty so, taking a little break from my Digimon series FOR NOW. I will continue it later on tonight hopefully lol. But, I figured it's time I get some other drawings done and out of the way. And also upload some drawings that I drew already, but never uploaded. THIS one, being one of them lol. So, this was a drawing I drew LAST winter 2017. And pretty much a year later, I'm FINALLY uploaded it lol. I've been meaning to upload it. But, then I started drawing other drawings, and didn't think this would fit with the other pair of drawings I drew at the time. But, it's FINALLY time I upload this lol. 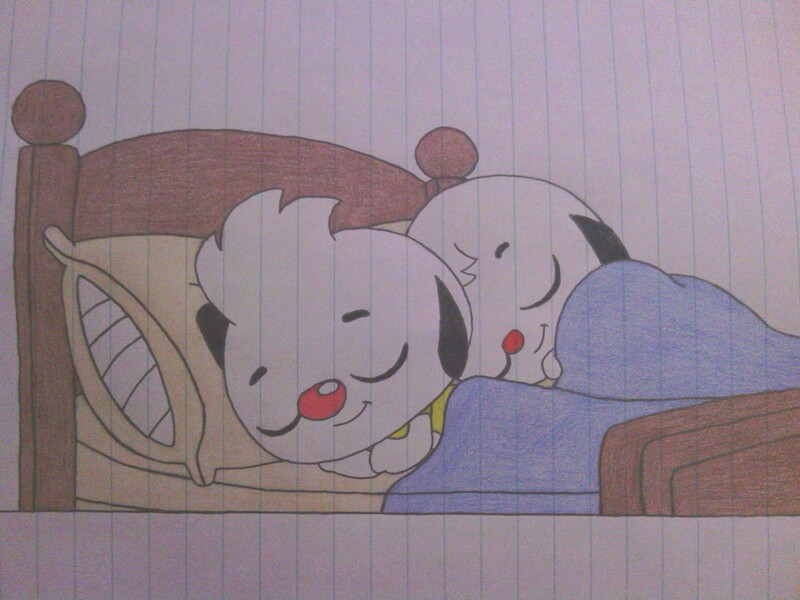 So, here's a cute drawing I drew of Junior and Lupi (from Playkids) sleeping together :3 My theory and idea when I drew this is that the family were staying in a hotel, or a summer house or something like that. Since, the brothers had to share a bed. But, I don't think they minded that lol. Since, they are brothers and they do love each other lol. But anyways, what do YOU think? Hope you like it, and thank you for viewing! And sorry I never uploaded this sooner lol.